NEW WINDSOR—He’s been where all the action was taking place around the world—Iraq, Afghanistan, East Berlin, South Korea, and more. 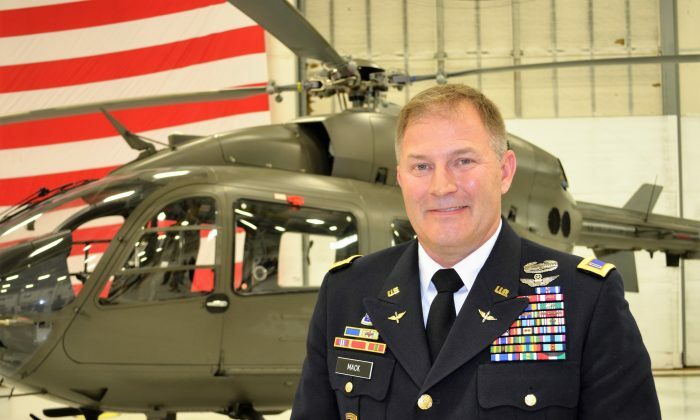 A key player in some U.S. missions, former Chief Warrant Officer 5, Alan Mack, handled himself with distinction as one of the most experienced helicopter pilots in the armed forces. “Alan Mack is an American hero. He is truly an American hero,” said Ed Harrison, general manager of Stewart International Airport, who attended Mack’s retirement and change of command ceremony. On July 1 Commander Mack announced his retirement after an illustrious 35-year career in the Army. He commanded the Second Aviation Detachment at West Point, which flies out of Stewart. Mack’s retirement officially begins on November 1. He is truly an American hero. The change of command and retirement announcement went off with expected military precision. Bouquets and single roses were presented to the ladies of both commanders. Music was provided by the West Point Band’s field music group, the Hellcats. Friends, family, and military colleagues gathered at the Second Aviation hangar at Stewart Air National Guard Base to celebrate his achievements and wish him well in his next endeavors. Lt. Gen. Robert Caslen, Jr., superintendent of the U.S. Military Academy at West Point, presided. Mack was conferred with the Legion of Merit for exceptional meritorious service. Chief Warrant Officer 4, Michael Rutledge, will succeed Mack as commander of the Second Aviation Detachment at West Point. Rutledge, a former Navy Seal, transferred to the Army in 2002. In their 14-year professional relationship, Mack mentored Rutledge and taught him to fly. When it was time to select a replacement, Mack hand-picked Rutledge as his successor. The Second Aviation Detachment is invaluable to West Point, Caslen said. The detachment supports cadet development by doing community outreach through parachute jumps at various venues. The detachment also supports local firefighting and rescue efforts. The hangar at Stewart houses UH-72 Lakota helicopters that are used in diverse missions in the region. County Executive Steven Neuhaus said the Second Aviation regularly assists in county emergencies. “They help if somebody’s lost in the woods, they help us with the injured.” Neuhaus said Mack and his unit were ready to assist during the fatal crash at last year’s air show. “We have a very good working relationship,” he said. Mack and the men under his command work with community groups , his favorite being the New York Air Show. “We’ve had a good run,” he said. Mack enlisted in 1981 and trained as a helicopter pilot. He has flown 6,700 hours in Chinook helicopters. The first Chinook helicopter was developed in 1962, according to militaryfactory.com, and is still in service today. Its primary roles are to move troops, and deliver artillery and supplies to the battlefield. He planned and led special operations exercises during Desert Thunder and Desert Fox, both in Iraq in the late 1990s. He updated the procedures for MH-47 helicopter crews used in special operations missions. “MH-47 was the only U.S. Army helicopter capable of supporting special operations in the higher mountainous regions of Afghanistan and as such played a major role in that theater,” according to specialoperations.com. Mack planned and led the first helicopter flights into Afghanistan for Operation Enduring Freedom, which led to the fall of the Taliban and the return of the U.S. Embassy in Kabul to American control. He flew the famed “horse soldiers,” the Special Forces ODA 595, the first time into Afghanistan. They were so named because they rode horses in the mountainous region, where they provided support for dropping laser guided munitions and helped take the cities of Kabul and Mazar-e-Sharif. “The opportunity to work here in support of the academy was a gift I didn’t see coming,” he said. Mack grew up in Portsmouth, New Hampshire, “a free-range teenager,” he said wryly. Deployed to South Korea after the assassination of South Korean Dictator Park Chung-hee, he witnessed the transition of that country to a stable democracy. He arrived in Germany before the fall of East Germany, passed through the infamous Checkpoint Charlie, and clearly saw the difference between communism and democracy. “Democracy was definitely better,” he said. Mack’s wife, Patrice Lestrange, beamed with pride throughout the ceremony. “The comments about his courageousness and his loyalty from three and a half decades is something that fills me up with just so much pride,” she said. Patrice does communications for the American Cancer Society and will continue in her job. “We do great work here in the Hudson Valley and I have a lot of exciting opportunities ahead of me here,” she said. Mack and Patrice are now entering a new stage together. He said they like the Hudson Valley and intend to make Orange County their home. Before that, “I’ve got to go see the grandkids,” Mack said. “And I’ll come back and see what I can do.” The Macks will be visiting his son Stephen, a naval pilot stationed in California, and a brand-new granddaughter. Looking forward to a second career, Mack said he hopes to do something in public service. The Legion of Merit is one of the U. S. military’s most prestigious awards, according to the Army Times, and one of only two metals worn around the neck, the other being the Medal of Honor. The original version of this article was corrected to indicate the Chief Warrant Officer Mack did not take part in the raid that killed Osama Bin Laden. The Epoch Times regrets the error.